As people, we often search for joy in the wrong places. We fill our lives with activities and people that we think will be our source of joy but...then they fail us and we are left where we were before hand - with an empty joy that's dependent on shifting things and people instead. We also allow our circumstances as well as people try to steal our joy. It's been well said, like in the brief video above, that... one of the secrets to experiencing joy it to keep seeking God where we doubt He is. Doubt clouds your vision and your mind. It makes you want to not believe but the reality is that no matter what you believe, He is still God! He's still sovereign! He's never surprised by what you're facing and He'll always be there to bring you through it as you cling to Him and lean into Him each day! Allow Him to work in and through you through His Holy Spirit! 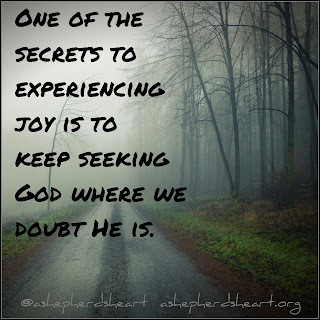 Sometimes we have fight to remember that we live by faith and not by sight, so, if you want true joy, His joy, Keep seeking God as He's your true source of joy. Even through hard times or dark times...you will find Him and His joy there even though your vision is blurred or is failing you. You cannot rely on your own vision to experience joy...you have to rely on His alone. Joy also can be experienced as you (in a very practical way) remember all He's already done in, through and for you! He wants you to experience His Joy because He loves you! Joy is part of His character and it's something we in turn, as His name bearers, should resemble too...with His help of course! Also, don't forget that you can live in Joy because He's called you according to His will and plan and died for you so that you may have salvation and no longer be separated from Him because of the sin that once separated you from Him! You will live with and be with Him for all eternity! That's something to be joyful about! You're true source of joy will never be found in the the temporal including the shifting things and people in our lives. No matter how many things or people you amass - you will never experience true joy in these things as they are a counterfeit of true joy. You're true source of joy will only be found in the eternal and never changing Lord your God through His Son Jesus and the work of the Holy Spirit in and through you! 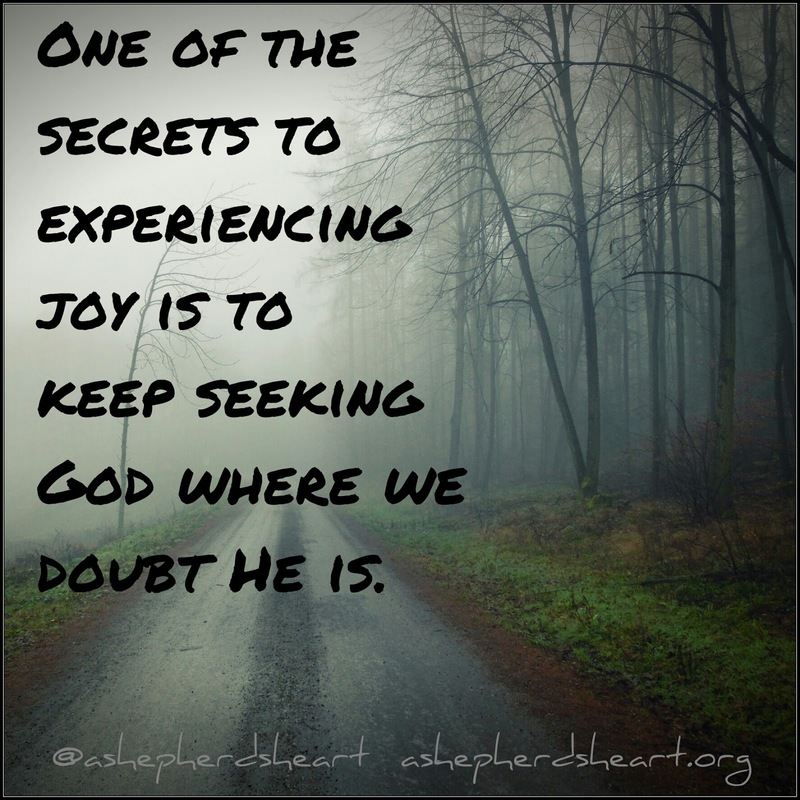 Don't be surprised to find Him and experience His joy where you think He is not! Keep Seeking Him! He'll always be there for you!